As a pick maker, I have been looking for this type of steel for a months, literally. I was a little skeptical about working with the scrap, and could not find a source for this steel ANYWHERE.... until now. Working with these government steel blanks that Peterson started offering has been phenomenal. They are exactly what I needed to take my picks to another level. They shine to a mirror polish, the steel outperforms the high carbon steel I'm accustomed to working with, and it's offered in a super slim .014" which just slithers through the key ways like a snake. I am happy to pay a premium to offer my clients the option to upgrade to this super steel. Not to mention Ken and Benita are a pleasure to work with. Hats off to the Peterson family for sharing this steel with the locks-port world. 10 Piece Hand Shorn Blanks- Gov't Steel .015"
10 Piece Hand Shorn Blanks- Gov't Steel .020"
10 Piece Hand Shorn Blanks- Gov't Steel .022"
Do you like to create your own tools? We've made it easier for you to do so, while using our famous Government Steel. Packed in tubes of ten, to let you try different bends and twists. Take a look at the beautiful work that Tipene accomplised with his! A great tutorial on how to make picks from blanks. We don't have many of these blanks. Get them if you want them, but do it today. This is a partial tang Pick I made using your 0.018" Gov Steel scrap. 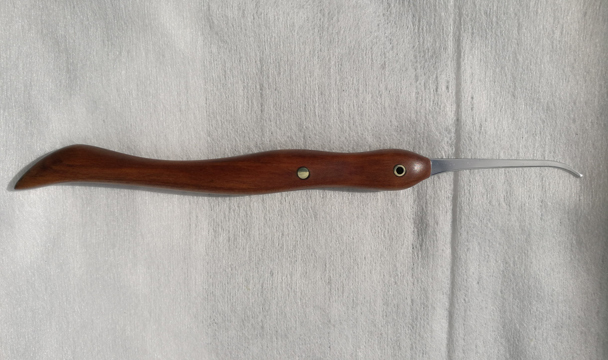 The handle is made from recycled New Zealand Rimu (I'm from New Zealand). It has 1 hollow and 1 solid brass pin. The Pick was all hand filed, shaped and sanded. The only power tool used was a drill press to drill the pin holes. Thanks for making Gov Steel available to hobby Pick makers like myself. It's great to work with quality stainless steel.